Few things can test your office organisational skills as much as a party or event! Catering is what brings many office events to life -- and it's why a lot of employees attend office-related events to begin with. Sydney CBD is one of the busiest cities for corporates and that means we see a lot of corporate breakfasts, lunches and conferences in the city. Yet with so many factors to account for, where do you even get started? Here are our tips to organise office catering in Sydney CBD. Breakfast, lunch, or dinner catering will all be handled differently. During breakfasts and lunches, a larger variety of lighter fare is often provided. During a dinner, it's more likely you'll be planning a few heavier meals. Being in Sydney CBD, it's important that you find a local caterer who can deliver on the day or set up at your office of venue in the city. Is the office event going to have any type of theme? If you already have an idea in mind, your catering company can work with you to plan the perfect menu. What dietary restrictions do you need to plan for? Consider the fact that you don't necessarily know whether some employees may have restrictive diets or need specific types of food. Make sure you ask people to let you know of any restrictions when they RSVP. What type of food does your office generally like? Every office is different. 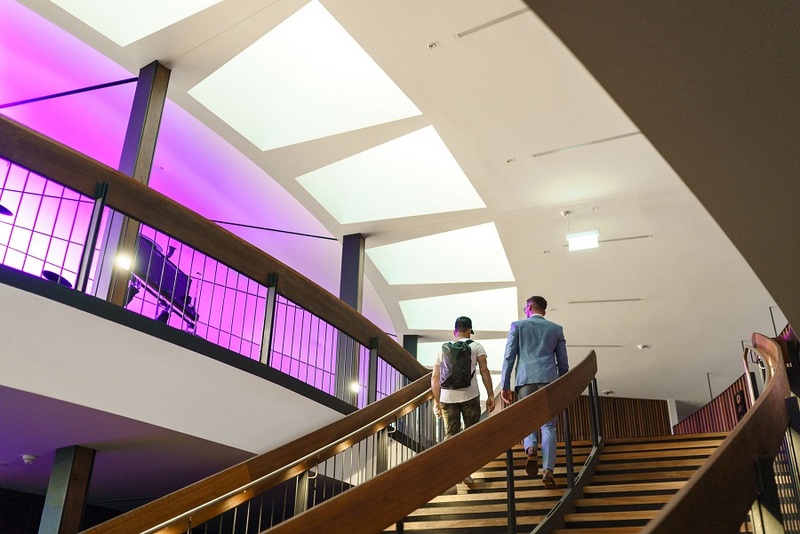 Some Sydney offices are more modern and contemporary while others want comfort foods. A wide selection of food may be called for if you aren't sure. Which beverages will you serve? Beverages are often an important factor when it comes to an event. Coffee, tea, and other beverages will complement your food. Once you have a preliminary idea of what you want, you can begin organizing the event itself -- including figuring out how many people will attend and contacting a professional caterer. That's where we come in! How many people are going to be coming to your catered event? Before you contact a caterer, you'll need to know roughly how many heads are going to be served. It will also be useful for your caterer to know where your office or venue is located in Sydney CBD so they can estimate travel time and whether they can deliver or set up at your office. Add the event to the office calendar, email or otherwise contact those involved, and make sure you have a reliable head count for the event. Keep in mind that you'll need a buffer to allow for a certain number of additional people to come. Once you have your basic information in place -- the type of food you're interested in, the date, and the head count -- it's time to call the caterer. 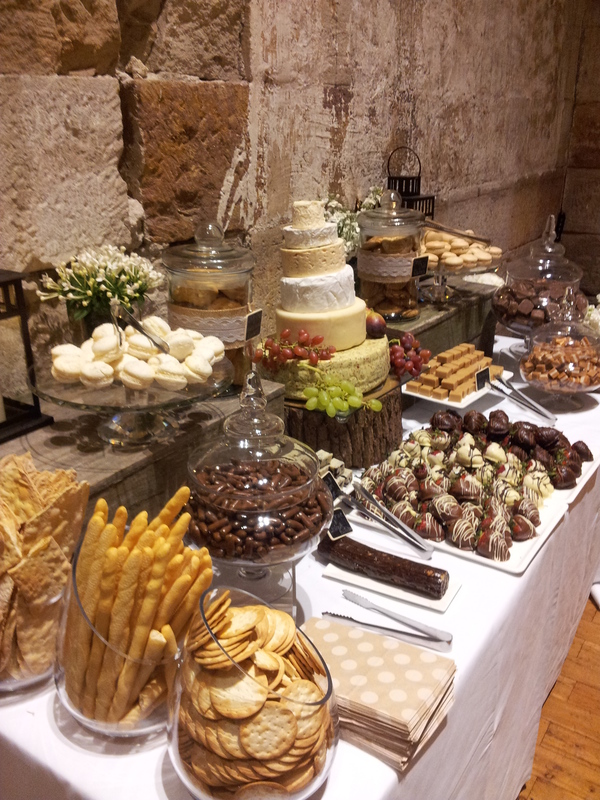 Many caterers are booked months in advance in Sydney, especially during busy holiday periods. Your caterer will be able to tell you what food they'll have available (including fresh, seasonal produce), and make suggestions as to your corporate breakfast, lunch or conference menu. Contacting your caterer fairly early on in the process is usually advised, as they'll be able to direct you to the appropriate types of food for your service, as well as making suggestions for desserts and drinks that the staff may like. In addition to this, you may need to make provisions for things such as chairs, tables, and serving tables -- many caterers are able to help with this, as well. 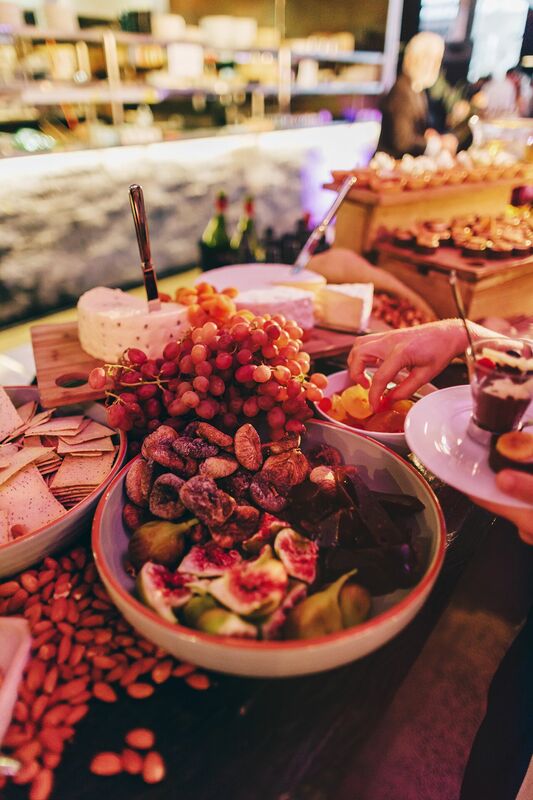 If the event is a complex one, such as an awards ceremony or a banquet that requires catering in Sydney CBD, your caterer will also schedule themselves in a way that will be non-disruptive to the event itself, while helping to plan floor space so that the food is featured but not in the way. 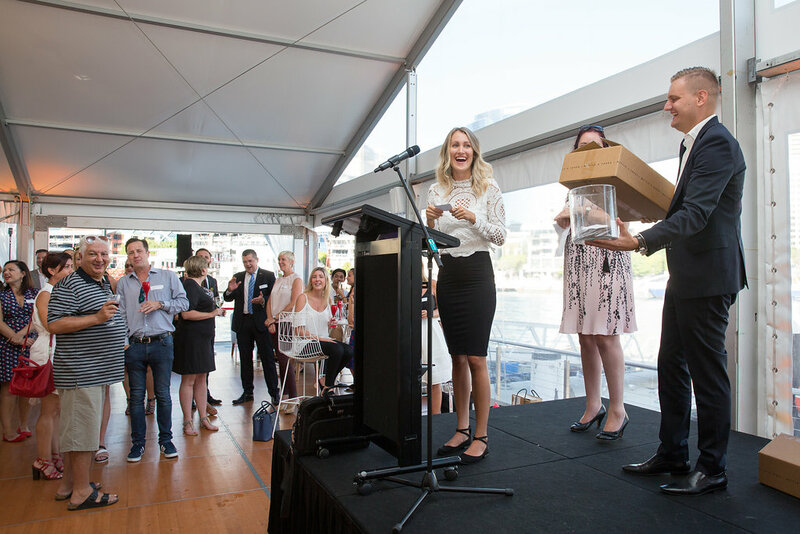 With a little work, you can create an office event in Sydney that the employees will talk about for months to come... as well as ensuring that the office event is as effective as it is memorable. 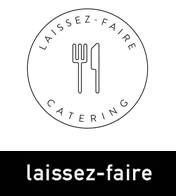 For more information about planning the perfect office event in Sydney CBD, contact the experts at Laissez-Faire Catering today. Make an enquiry or give us a call on (02) 9209 4810. We can't wait to hear from you! If you are the assigned event planner in your office, we’ve got some tips to help make conferences and corporate meetings a bit less boring. Suggest a breakfast meeting or lunch meeting to your boss. 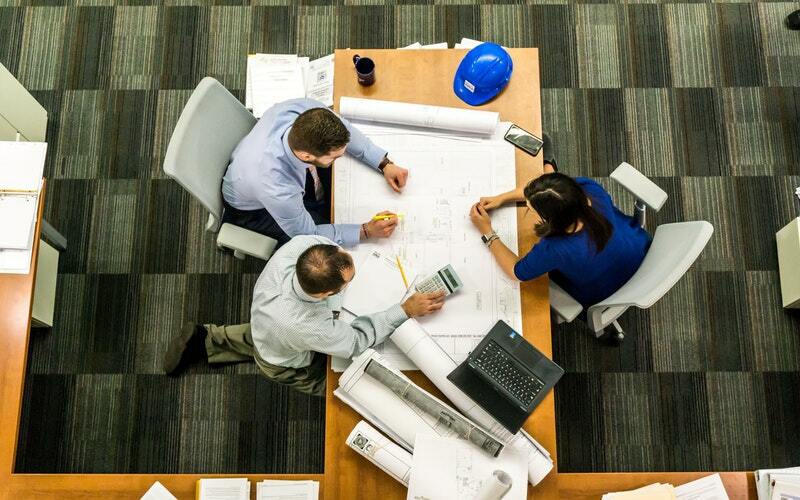 If you haven’t tried this before, you might find that getting the office together for some food and coffee during the meeting will lift spirits and make the day go faster. Morning meetings tend to be more efficient for decision making. The mind and body are fresh so any issues can be handled without too much drag. It’s also easier to schedule time for a meeting in the morning rather than later in the day or after work. Also, most breakfast meetings are done within an hour or two, thus it will not hinder any other schedules during the day. Plus fresh juices, tea and coffee. Take note that not all corporate meetings can happen in the morning. Meetings that are meant to solidify business or working relations or are meant to close deals are best held during lunch time. You might want to consider a lunch meeting for more focused training meetings, company announcements and discussing new business deals. Sesame beef and lemongrass skewers with chili dipping sauce. Hiring a catering service that will take care of the food is one item you can take off your own plate when planning a corporate meeting. Serve up some great food so staff can focus on building solid working relationships and getting work done. Launching a new product or service is a big deal for many businesses. After so many hours of research and development have been poured into the project, it’s time to deliver it to clients. A launch party calls for a bit of excitement and high class event planning! This blog post will give you some expectations for your first launch party and answer any of those burning questions about how to throw an exceptional corporate event or product launch. 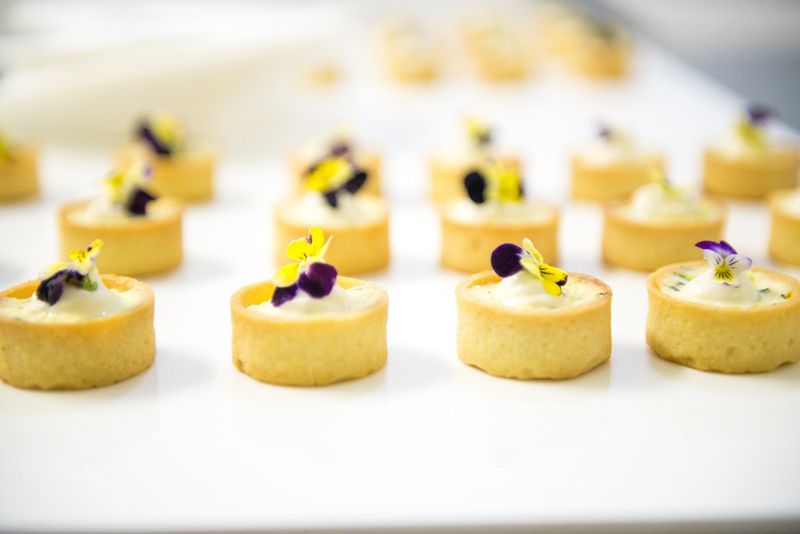 If you’re in Sydney, Laissez-faire Catering is the best option to help your product launch be everything you want and more. Planning an event isn’t easy. The first step is knowing what you want to achieve. What does your business expect to happen? What’s the point of your event? Do you want to create a buzz? Do you want to connect with industry influencers? Do you want to get new prospects and take care of loyal clients? 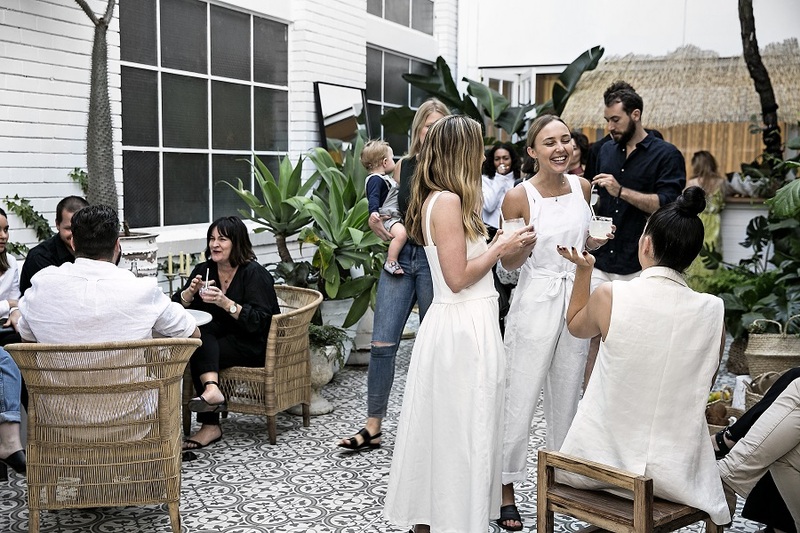 Before you have a meeting with your event organiser and your corporate Sydney caterer, you should be clear about why you’re hosting a launch party. These questions can help you in deciding the theme and the size of your product launch. 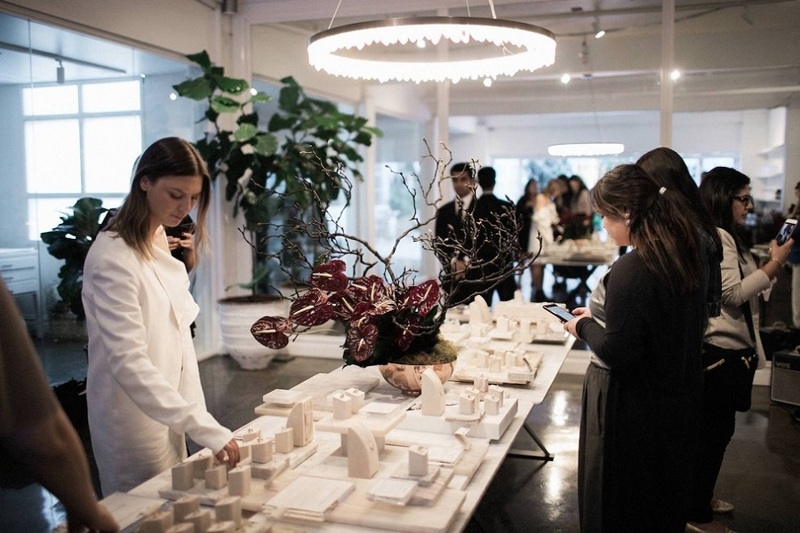 For example, if your primary goal is to convince experts and industry influencers that your new product is the best, a modern showcase with expertly created canapes and cocktails is a great idea. Think premium venues, lighting themes and excellent wait staff. Alternatively, if you want to create excitement about something new and your target audience is young, a more casual yet still high class atmosphere might be appropriate. A cool DJ or a live band can provide entertainment, while food stations offer canapes and over the top cocktails. One of the most important aspects of a successful product launch is the location! 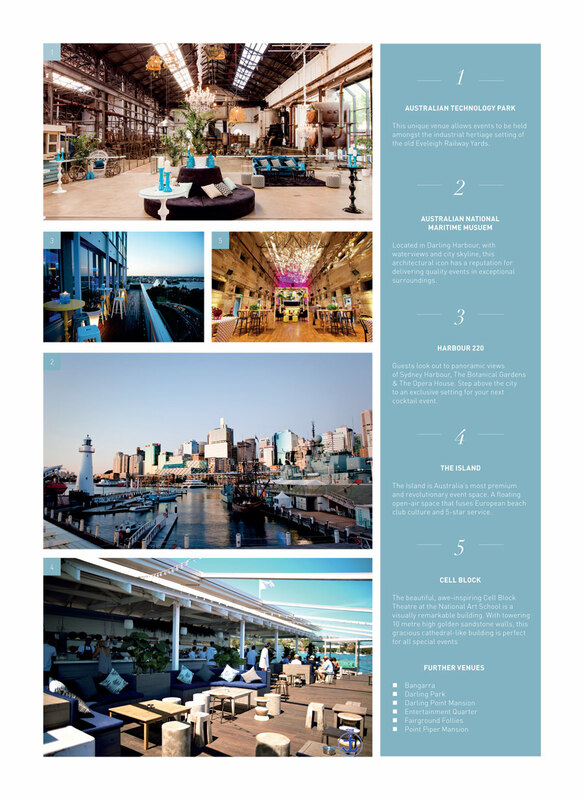 Laissez-faire has worked with many corporate clients to find the right Sydney venue to suit the theme, style, budget and the guest demographic of their product launch. Involving your caterer in the search for a venue ensures everything goes smoothly on the event day. Take note of where your guests work or live and choose a venue that will be easily accessible for the majority. Make sure that there is ample parking space or good access to public transport - let your guests know these details when the time comes to invite them all. 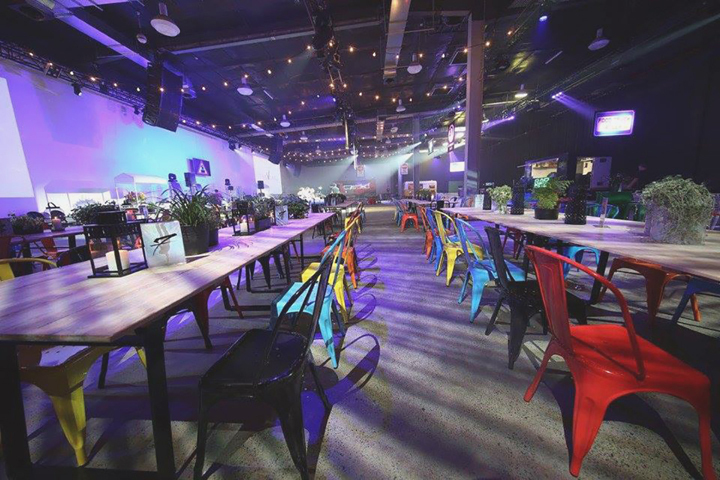 La Porte Space is one of our newest venue spaces and is perfect for product launch events. Find more information here. Some corporate catering services in Sydney are doing the “one-size-fits-all” approach to their food and service. This will not make your event stand out. Your new product or service is special and should be celebrated with a menu made just for the event. This is the most formal style and has groups of guests seated at tables assigned to them. Each guest is served three courses or more. A plated dinner will need more staff to prepare, plate and serve the dish. The good thing about this style is it will give your guests more time to mingle and chat with others at their table. It also produces a very classy atmosphere and will impress stakeholders and other guests. If you want to provide a wide variety of food and drinks, then a buffet style is your best bet for your product launch. This is suitable for large parties with 100 and above guests. Plus, the guest will not feel forced to eat something they don’t like because they will have different varieties to choose from. The service cost is lower and only a few wait staff are needed to serve guests. This style has a more casual feel, but the different types of food on offer will wow guests. 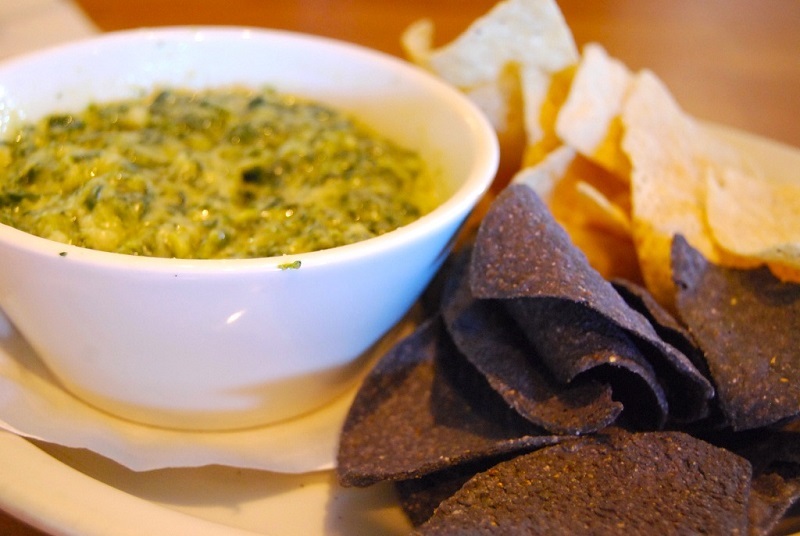 Remember to ask us about gluten free, vegan and vegetarian options! Similar to a buffet-style serving, high tables may be provided but there will be no seats. If you have 500 young (or young-at-heart) guests or more, this is your party. This type of party will have a livelier feel because your guests can go around looking for different dishes or canapes and can mingle with other guests while eating and checking out your new products. Cocktails, beers and other types of alcoholic drinks will make this style even livelier. Food stations or food booths can be placed strategically so that all the guests can go around and enjoy while appreciating the launch of your product. This is where a DJ or a live band will come in handy. To make your party a truly wonderful experience, you can ask your caterer about the current corporate catering food trends that can be incorporated into your event. Locally-sourced menus will continue to be popular. Some of your guests may be looking for high end locally produced meat and organic vegetables. Artisanal breads, cheeses, beers, pickled olives, pickles and wine. This will entice your guests and will surely be talked about alongside your products during the launch party. High tech, low glitz decorations. There will be fewer sit down, plated dinners. 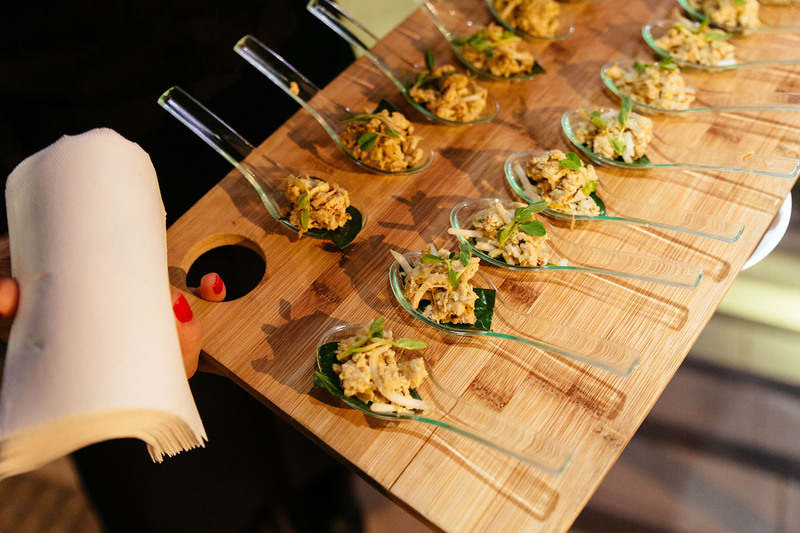 Food stations and hours d’oeuvre are becoming more popular with many product launches paired with artisanal beer, wine and cocktails. Smaller servings and bite sized pieces are easier to eat when walking around a product launch event. Make sure your guests have places to put down their glasses or small plates when they are done with them. Looking for food inspiration? We have lots of different menus to suit your event. 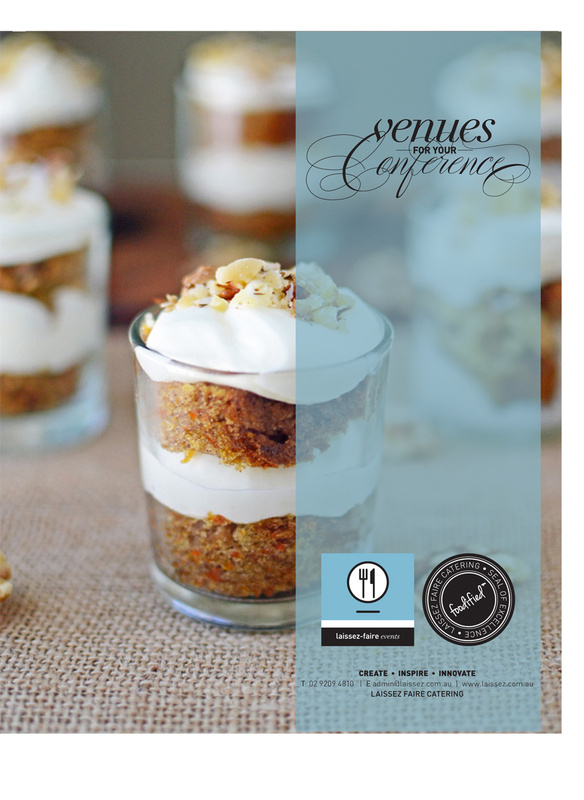 Check out our canapes, drinks, plated, shared and other menus here. 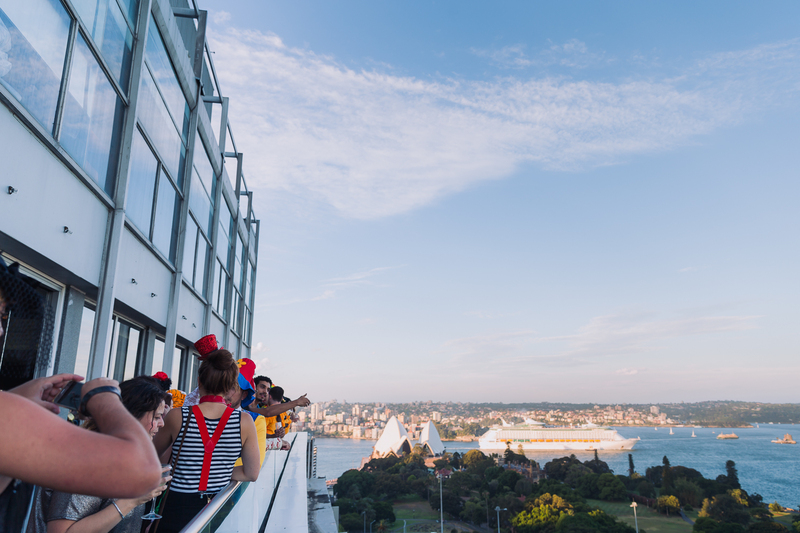 Need some help planning your own launch party in Sydney? Laissez-faire Catering can do all of the above and more. Just ask us. Did you know corporate events that take advantage of catering are often far more successful than events that don't provide guests with food and beverages? When guests attend an event, they want to know their time and presence is valued, and there is no better way to do this than by offering them a variety of food and drink options. 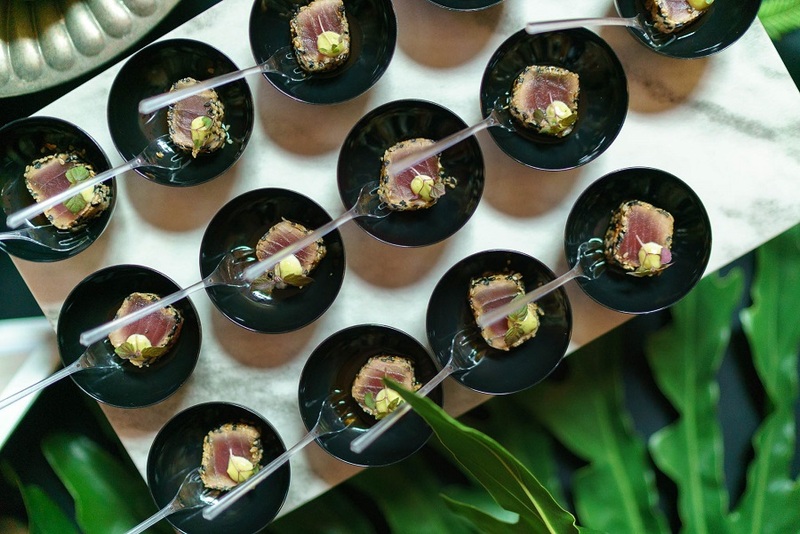 When you take advantage of catering services, such as those offered by Laissez-faire, you'll be able to save time and money by letting the professionals handle the food and beverage aspects of your event. More so, you'll have more time to focus on other pertinent parts of your event, such as seating arrangements and speeches. Laissez-faire offers a versatile menu and always pays special attention to detail, both of which are paramount to making a statement that is sure to impress your guests. For now, let's take a quick look at the top 2018 catering trends for corporate events. No matter the type of corporate event being hosted, you will want to choose foods that positively reflect your business or brand. And because of this, you will want to invest in high-quality catering, which can also aid in promoting the values of your company. You’ll be showing guests you truly care about them by satisfying their appetites. Events offering gluten-free choices are rising in popularity. Frozen desserts that are gluten-free are a great choice for your event because they are convenient: simply thaw them and put them on a plate. They come in all different flavors and are a unique treat that allows you to cater to guests with varying dietary needs. Even if you choose to lean toward healthy catering for your corporate event, you can still take advantage of an all-time favorite food: bacon. Caterers are adding bacon to the menu in a versatile and creative way to spice up food and beverage offerings. For instance, brussel sprouts and scallops wrapped in bacon will add a small amount of flavor to your dishes and soups, bringing out the taste people love in a healthy dose. Food trucks are becoming a popular option for corporate catering. This type of catering goes beyond burgers and tacos, giving you a wide variety of culinary delights to choose from that are suitable for corporate events. The use of food trucks at events helps to combine convenience and the element of fun all while providing guests with tasty food selections. Even better is that food trucks are a versatile catering option for both outdoor and indoor events. Corporate events can also take advantage of catering services that serve light snacks, such as vegetables, dips, crackers, and cheese. These are ideal for cocktail parties and networking events. Food stations will help keep your guests fed and happy as they mingle. If your event has a larger dinner planned, snack stations are the perfect option for satisfying guests before the big dinner is served. Offering upscale food options is a great way to surprise your guests and do something fancy for them, which as a result, increases their trust and loyalty to your brand. Comfort food is always a big hit at corporate events. Opting for catering services that serve ragu sauces and hearty soup dishes is a great way to provide substantial textures and big flavour to the menu. 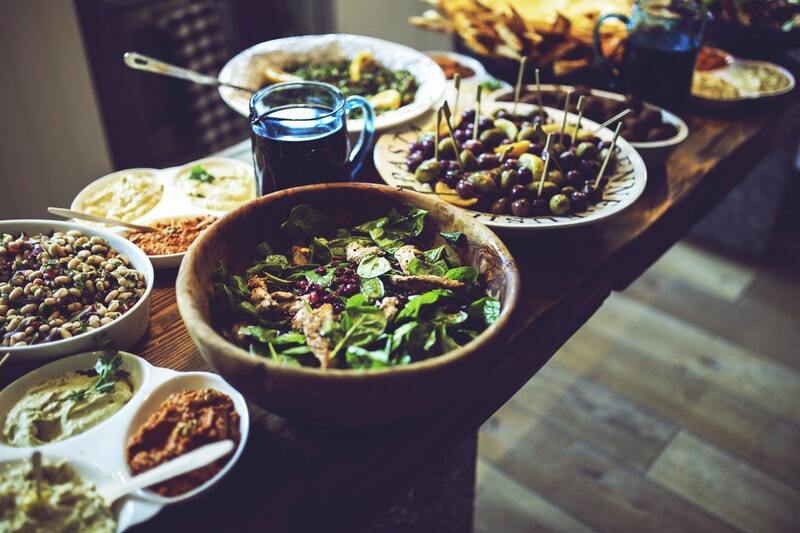 You’ll also want to make sure you choose a catering service that offers healthy food choices, like lightly fried sweet potatoes, zucchini fritters, and other vegetables that are in season. Foods like burgers and spaghetti never go out of style; this makes for a safe catering option for your event. With classic foods, you can take your guests back to their childhood and you are sure to satisfy everyone’s taste buds. Even if you are hosting an upscale corporate event, these food choices will work for any formal experience. Another corporate event catering trend that is worth investing in is one that crafts cocktails with the specific flavors and tastes of the food selections being served. 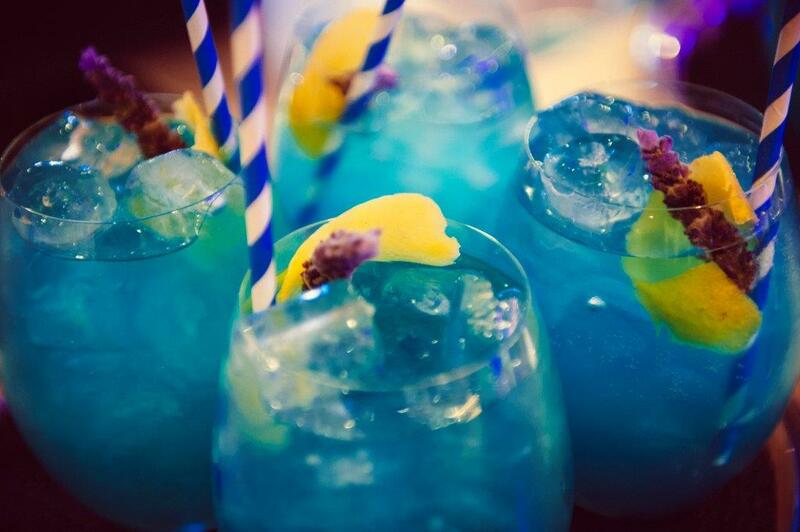 Cocktail catering is a great way to reflect a themed event. If you would like to learn more about the top catering trends for corporate events, please contact Laissez-faire today. Need a Mid-Year Office Celebration? Start Planning a Christmas in July Party! Towards the middle of the year, employees can start feeling a little fatigued. If it's all just work, work, work, their attention will start to drift, and they may not be as attentive or productive as they could be. Having a celebratory party can give employees something to look forward to, show them they're recognised, and encourage them to work harder. "Christmas in July" is a fun and festive theme that everyone can enjoy. Why Plan for Christmas in July? Christmas in July is a creative, quirky excuse for a celebration that comes with an easy, preset theme. Rather than having to plan everything out of whole cloth, you can simply take a page from any holiday party book. Christmas in July is also something that everyone understands and that everyone can get excited for! Just like any party, you're going to have to get together the decor, food, and activities. Think about some of your prior year Christmas celebrations for some easy ideas. 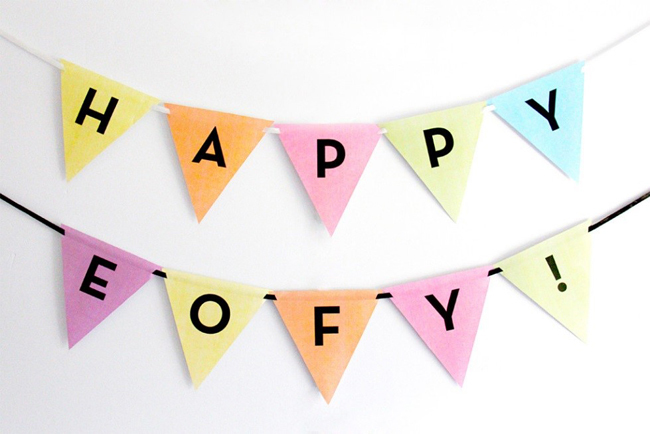 Though holding a celebration in your office is convenient, it really just surrounds you with your work. Choosing an off-site venue gives your employees the opportunity to experience something new and truly relax outside of the day-to-day operations. Ideally, you want a venue somewhat close to your business; you don't want to make employees commute too far. Luckily, it's often fairly cheap to book a corporate venue in off months -- far cheaper than during actual holidays. A Christmas in July party is more fun the more "all out" it is. From fake snow to mistletoe, go wild with the decoration. At the start, you can create a "Christmas planning" party that's filled with volunteers. The more the employees want to participate, the better a job they'll do. Don't forget that Christmas means different things to different people. If you want your holiday celebration to go over without a hitch, encourage employees to add to the decor and to pitch in their own ideas. In the spirit of inclusivity, you can ask them what the holidays mean to each of them. And don't forget the fun holiday themes. There are many "tropical party" Christmas themes and "futuristic" Christmas themes, which you may have discounted for your actual holiday parties but can be acceptable for a Christmas in July. It can be difficult to find Christmas decorations during the off season. Look at wholesale outlets and online stores for deals -- or ask for donations of old decorations from employees. If Christmas in July becomes a regular thing, you can reuse decorations from year to year. Some tinsel and bright lights, and you'll be set for at least two holidays every year. Food is what makes Christmas truly feel like Christmas. From eggnog to peppermint bark, there are appetizers, drinks and desserts that people crave throughout the year. During the holiday season, these foods are often made by family members and friends, contributing to the loving atmosphere of Christmas. At your party, they can all be provided through catering. Though pot lucks are fun, they also often come with additional work for employees. Employees may stress over their dishes -- and the dishes themselves could represent liability concerns, due to unsafe food handling and allergies. Overall, corporate catering services are usually the safest and most convenient option. Are there any foods that you're allergic too? What drinks make you think of the holidays? These questions will help you personalise your Christmas in July party for your employees, increasing their enjoyment. Many employees go to corporate events primarily for the food, and it's food that they're going to be thinking about later on. Set aside some time during your Christmas in July party to give awards and gifts to your staff members. Recognition matters. Give gifts based on longevity and merit and employees will be more likely to work hard for the rest of the year. Holding some raffles throughout the event is also a good way to encourage employees to stay and enjoy the party throughout, as it adds to the festivities. For a Christmas in July event, you want to stagger events throughout, so employees constantly have something going on. Some team-building activities can include building a gingerbread house together or playing some casual party games. This helps employees get to know each other in a professional environment, encouraging them to work better together and learn about each other's idiosyncracies. As long as you have everything planned out, Christmas in July can be a great opportunity to both reward and motivate your employees. With activities, catering, and awards, you can turn it into a mid-year productivity boosting event. We can help you with everything from the menu to the venue. Just ask us how! If you haven’t already booked everything for your office’s end of year holiday or Christmas event, now’s your last chance! 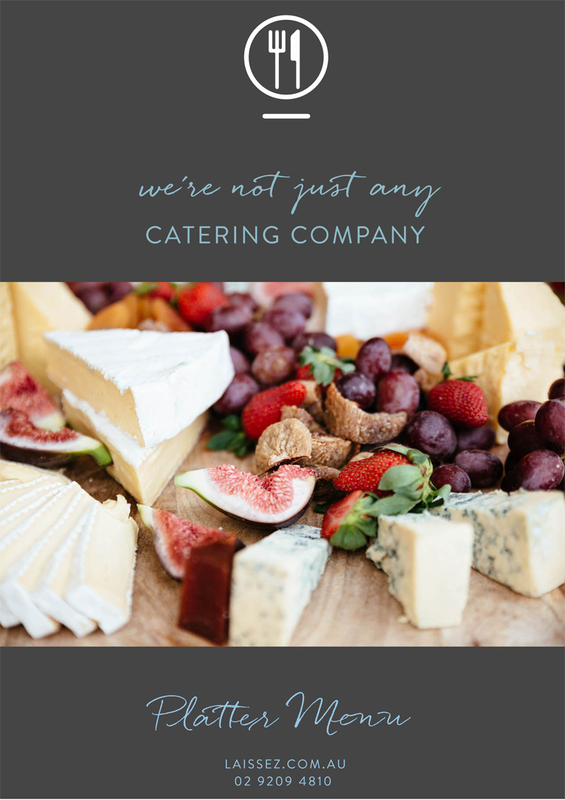 Choosing a corporate event catering company for your event is no easy task - but here at Laissez-faire, we’ll make it easy for you. Discuss with the event planner about decorations and entertainment. Sydney is host to so many gorgeous venues for this time of year. Don’t be afraid to start ringing venues today or asking us about available dates at any of our venue listings - check them out here. One of the easiest options for you to consider might be an in-office event. If you’ve got a large enough meeting room or conference room (or if your staff group is on the smaller size) this is a cheap option that can be organised quickly. Our catering services can come to you! If you’re after something more exclusive or hoping to give your staff an event to remember, we’ve got a great option for you. 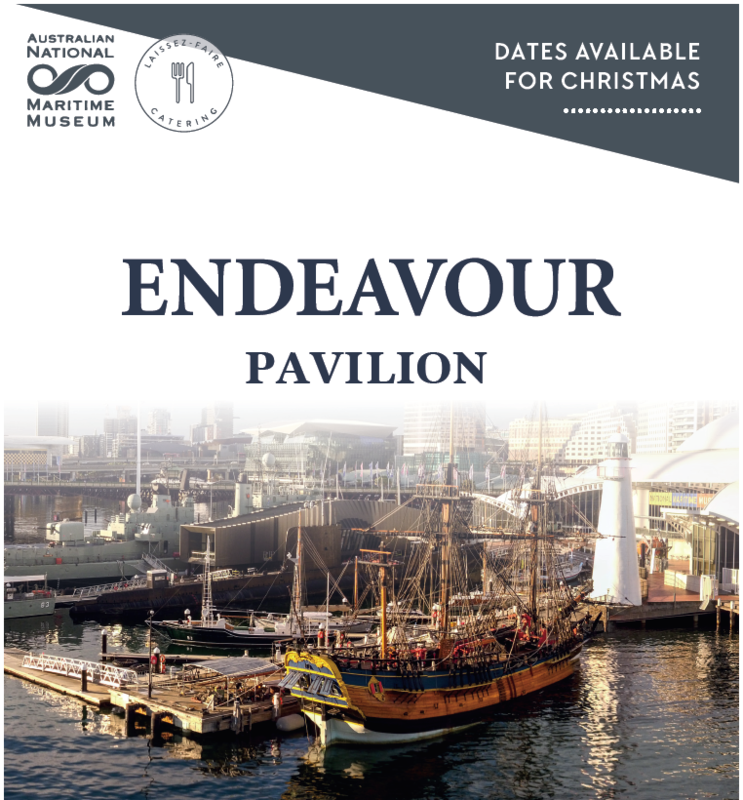 The Endeavour Pavilion at the Australian National Maritime Museum in Sydney is our newest venue space with dates available for Christmas. Plus coffee and Christmas-themed sweets after the meal. Don’t forget the Drinks Menu! You can download our menus for free by clicking on the links. Enter your details and you’ll receive the menu in your inbox. Great food really makes an event come alive, so choose whichever menu sounds most delicious to you. We also have a range of gluten free and vegetarian options in each of our menus, so everyone is covered. We are happy to cater to any other dietary requirements - just ask us! At the Endeavour Pavilion, all the boxes are ticked! If you'd like to know more about your Christmas event options or you want to book at the Endeavour Pavilion, just make an enquiry or give us a call on (02) 9209 4810. We can't wait to hear from you! Laissez-Faire has now hosted many events at The Venue in Alexandria. It's one of our most popular event destinations and for good reason! The Venue Alexandria is Sydney’s newest and most unique premium warehouse event space. 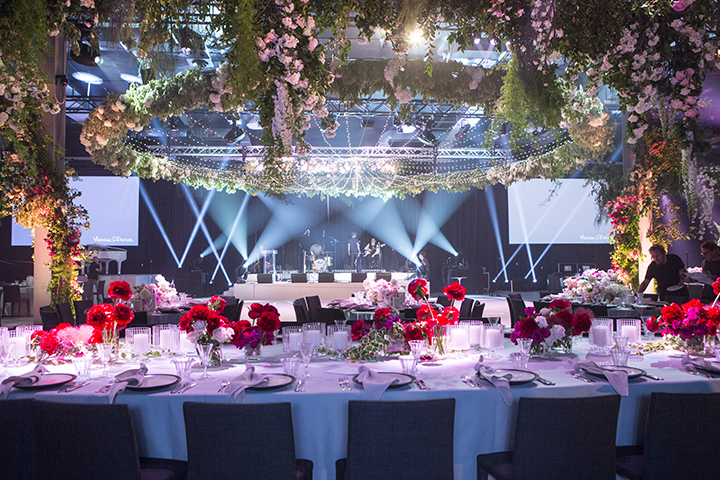 Located conveniently between Sydney’s International Airport and the CBD, they offer clients a large, flexible warehouse space with 5-Star amenities catering to a wide variety of events including gala dinners, product launches, fashion parades, conferences, corporate functions, social events, and weddings. 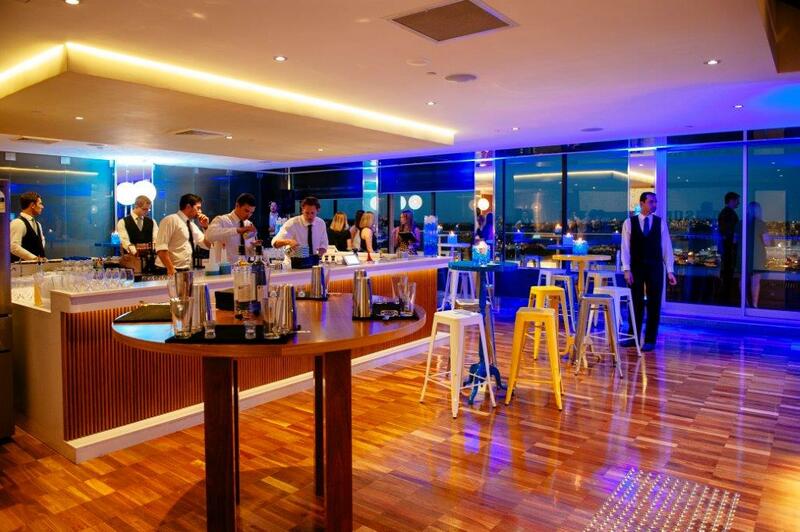 With capacity for 1000 guests, this is the best Sydney venue for large gatherings and once-in-a-lifetime celebrations! If you'd like to book an event at this venue, or just want more details, please contact us. It's The Season for Spring Platters! 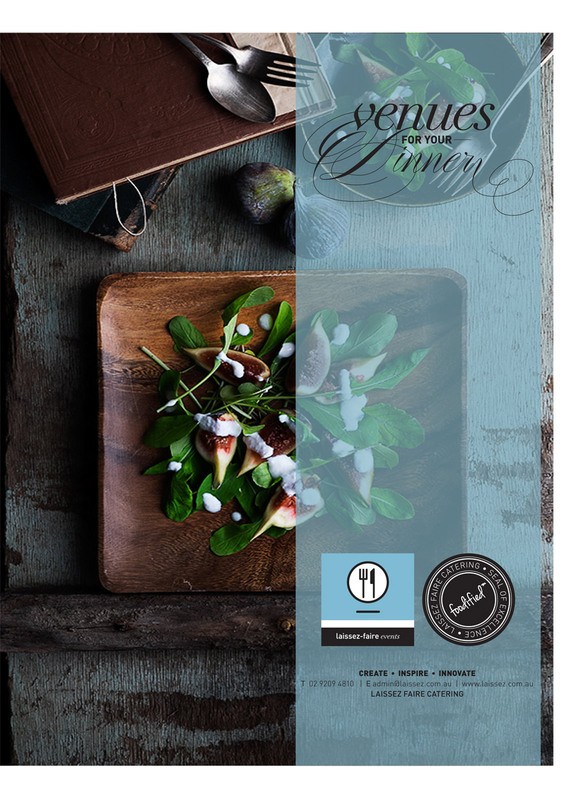 Today we feature our delicious Platter menu: perfect for Spring corporate or private functions. Platter menus can be delivered to your event location and are ready to serve. Let's take a look at the delicious recipes featured on one of Laissez-faire's most popular menus! The Platter menu is fantastic for outdoor or indoor Spring celebrations and get togethers: from corporate office meetings to private garden luncheons. Pair this menu with some delicious coffee or iced teas and you've got a Spring event to remember. Australian Cheese Platter - a selection of soft and hard cheeses served with quince, fresh & dried fruits, nuts and crispbreads. Sushi Plate - California rolls, inside out rolls, sashimi salmon, soy, wasabi and pickled ginger. Spanish Tasting Plate - Chorizo, roasted peppers, garlic mushrooms, polenta chips with sea salt, Jamon, tomato rubbed bruschetta. 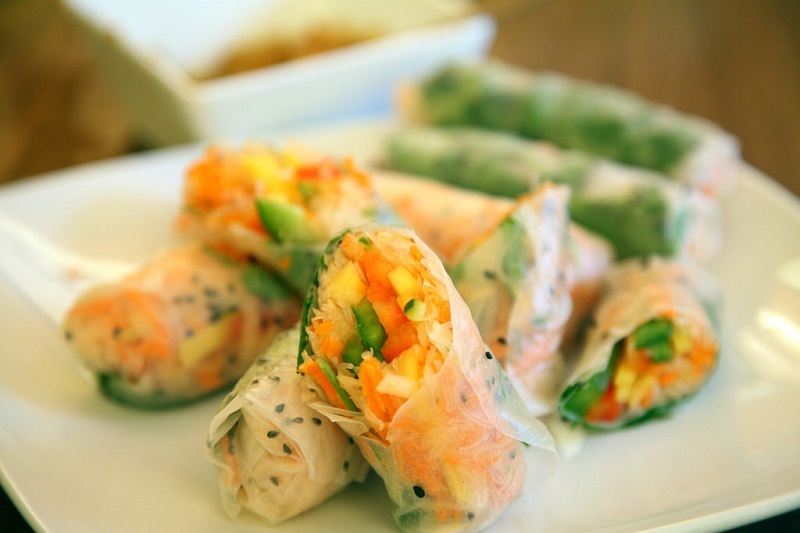 Rice Paper Rolls - Selection with nuoc cham dipping sauces. Mixed Dips Plate - Assorted dips, crisp pita chips and vegetable crudites. Charcuterie Plate - Cured and roasted meats, cornichons, olives, chutneys and focaccia. Peking Duck - Pancakes, with hoi sin and shallots. Vegetarian Antipasti - Grilled vegetables, feta, mushrooms, artichokes and crust baguettes. Don't feel shy to contact us if you'd like to enquire about this menu at your next event. As September slowly approaches we can take off our jumpers and welcome the Spring sunshine into our lives. Whether you're thinking about planning a corporate or private event to celebrate the changing seasons, now is the time to begin preparations. For a corporate Spring cocktail event, start collecting RSVPs now to save the date. The first weekend of September is a great time to welcome Spring and celebrate some company milestones. It's the perfect time to remind staff how much they mean to the team. We're on the home stretch to the end of 2017, and employees can start to feel stressed out and burnt out. Give them something fun and exciting to look forward to. Book a venue away from the company office - it's not the same if you just bring food and drinks into the office space. 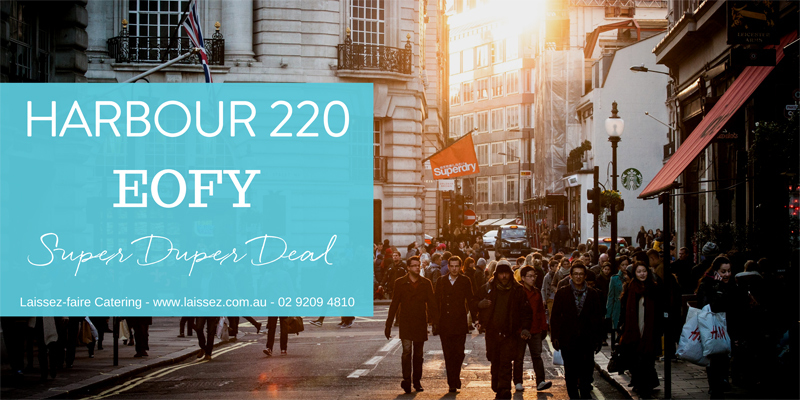 Let guests get dressed up (casual business attire) to travel somewhere in the Sydney CBD where they can chat with their friends from work in a different setting. Try to book a venue with plenty of outdoor space and some undercover area. If you want a completely outdoor venue so your staff can get some sun, a great idea is to provide parasols so guests can get some shade if they desire. Check out our listing of venues perfect for cocktail functions. Corporate cocktail functions should be relaxed, easy and perfect for mingling and nibbles. For a private Spring cocktail event, you have heaps of options! If your guest list is small, you could even hold the event in one of Sydney CBD's public parks. If your guest list is larger, opt for a spacious venue with indoor and outdoor seating. Some guests would rather stand and mingle or move around the food and drink stations. Cocktail functions are great for celebrating any event: an engagement, a graduation, a wedding reception or just getting a group of friends together to catch up over good food and drinks. 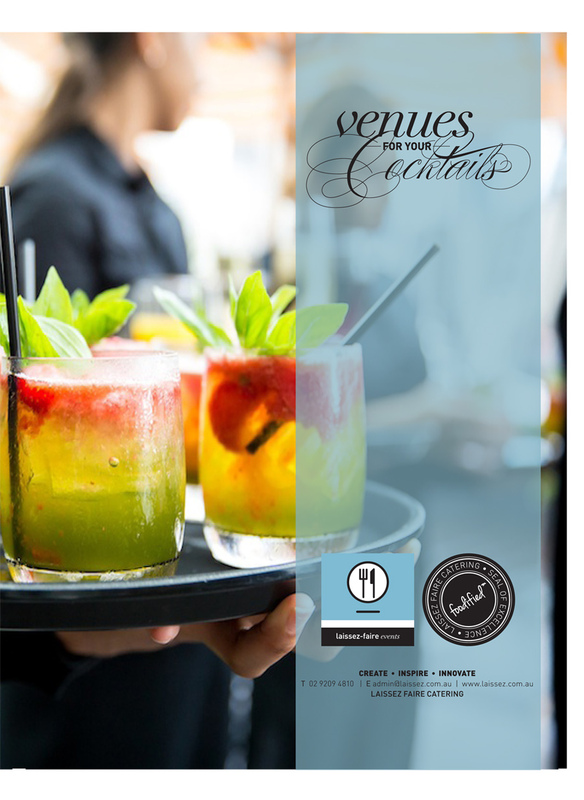 Check out our drinks menu and our canapes menu to get some ideas about what to serve your guests. Get into the spirit of things for your Spring cocktail event by including some decorations at your venue. Hang some decorative flowers from the roof of an outdoor canopy. The smells will be divine and it will add a rustic beauty to the event. Don't skimp on the drinks for this event. Think about creating a signature cocktail with delicious Spring flavours. Think grapefruit, lemon and lime, and strawberries galore. Punch bowls are perfect for this type of event. As well as this, have a drinks station set up with a couple of bar staff so guests can choose their own drinks. Serve food that is easy to pick up and eat while guests are mingling and also holding a drink in their other hand. 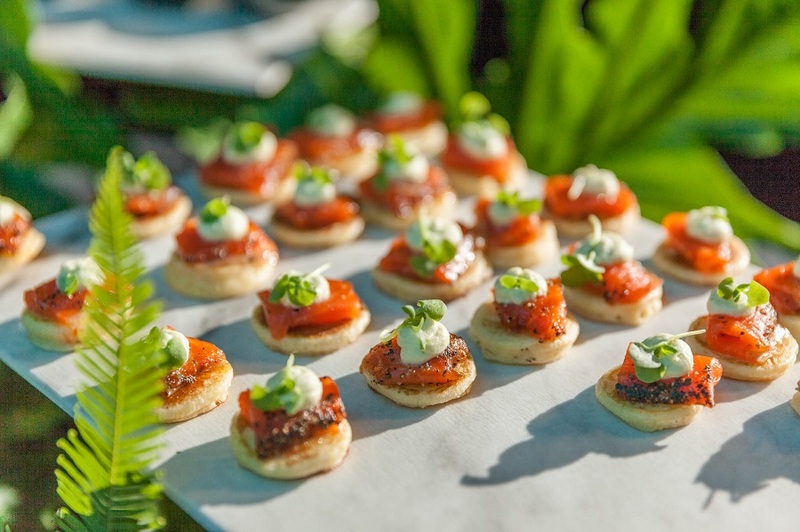 Canapes are perfect for Spring: not too heavy but just the right amount of food to stay full during the event. Sushi is usually a great canape option, but we'd advise against it if your venue is out in the open where food can get ruined by the heat. Instead, think small bites of cured meats, vegetable creations, cheeses, breads and oils. Treat your guests to some sweet palate cleansers after they've had their fill of food and drink. 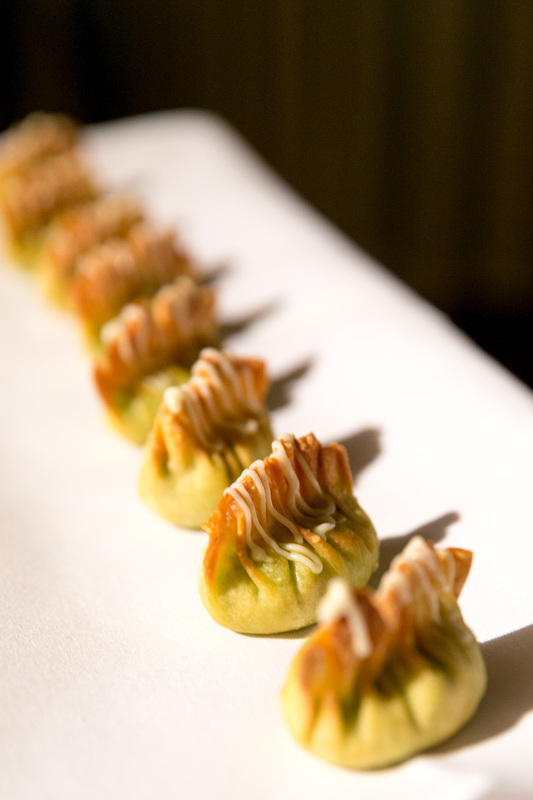 Keep them canape size so guests can hold them in one hand and eat them in a quick bite. Another great option is to serve fresh fruits and nuts for dessert. Keep these refrigerated until they are needed. Dried fruits are also just as tasty and easy to serve in the heat. Hopefully, these ideas will give you some inspiration to start planning your corporate or private Spring cocktail event. 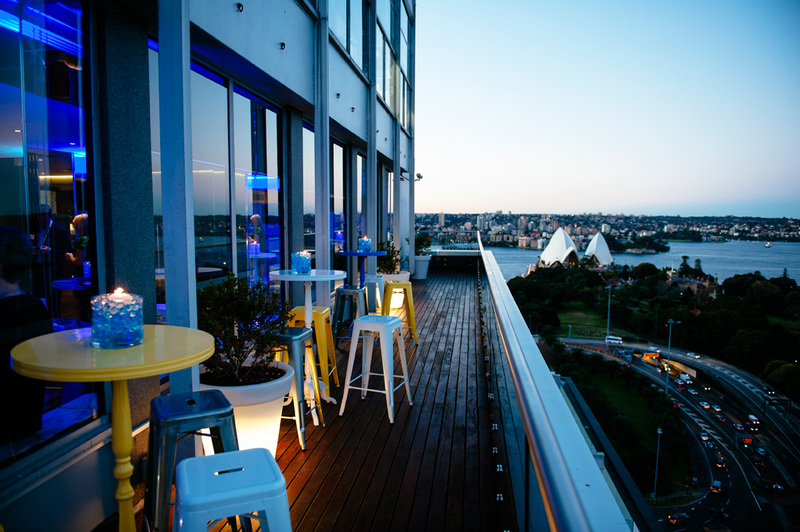 The Venue Alexandria is Sydney’s newest and most unique premium warehouse event space. Located conveniently between Sydney’s International Airport and the CBD, they offer clients a large, flexible warehouse space with 5-Star amenities catering to a wide variety of events including gala dinners, product launches, fashion parades, conferences, corporate functions, social events and weddings. Originally the site of Hannanprint, The Venue space was part of a joint publishing venture between Australian Consolidated Press and Fairfax Suburban Publications Pty Ltd. In 1986 Hannanprint Sydney relocated to Alexandria and was named the largest one site printing facility in the Southern hemisphere. The Venue Alexandria offers so much in terms of venue space and possibility. 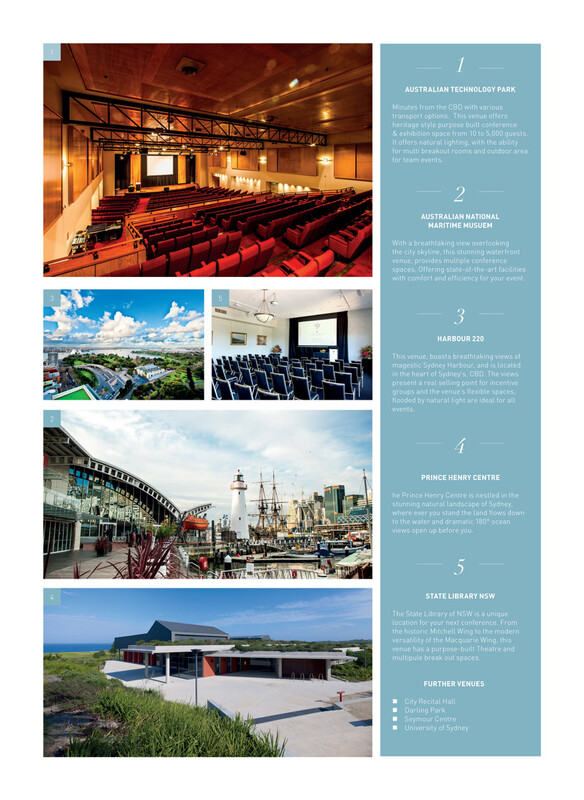 As an exclusive, well-placed venue in Sydney, The Venue Alexandria has been very popular with our customers recently. Check out the Laissez-faire Instagram account for some candid shots in The Venue. 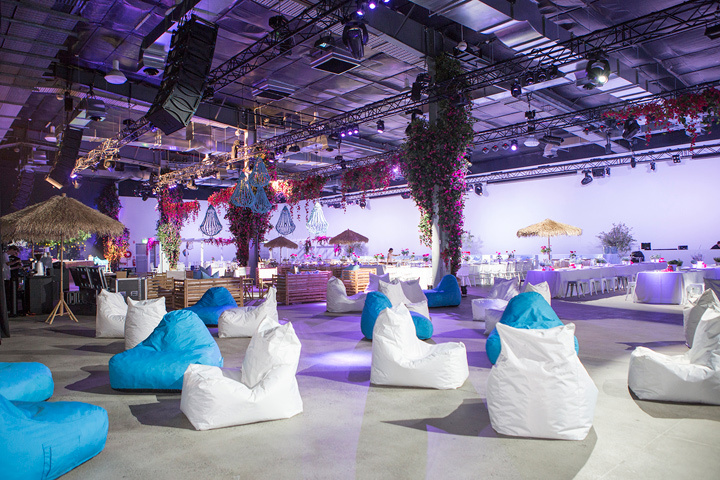 With a floor space of 1,900m2 and a ceiling height of 7.7m, there is space for every guest (up to 1000) no matter what kind of event you are planning. 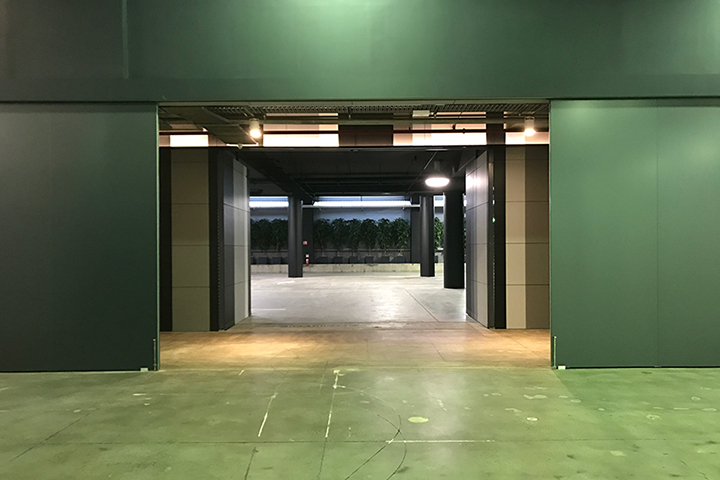 The large entrance doors to The Venue prepares guests for the wide open space within. This is the perfect entrance for a red (or any colour) carpet to make guests feel special and your catering staff handing out cocktails as they enter. Once the guests enter the space, they are greeted with an expansive warehouse space decorated to the nines. ... And don't forget, The Venue is the perfect space for a wedding. Check out more images of The Venue Alexandria here. Consider The Venue Alexandria for your next gala dinner, product launch, fashion parade, conference, corporate function, social event or wedding. Contact us to make an enquiry about holding your event at this venue. Food and drink stations are a popular choice for corporate daytime conferences. From private rooms to more elaborate venues, these stations never fail to accommodate for guest lists of all sizes. During daytime conferences, food stations are an even more attractive alternative to serve snacks and meals. Here at Laissez-faire, we offer options based on our clientele’s needs. The most commonly requested food stations include juice bars, biscuit bars, coffee bars, snack bars and dessert stations. Fresh juice is always a healthy option for any event and we’re sure your guests will appreciate the option in the coming summer months! Use seasonal produce to create some thirst-quenching juices or let guests choose their own combos. Who doesn’t love coffee? 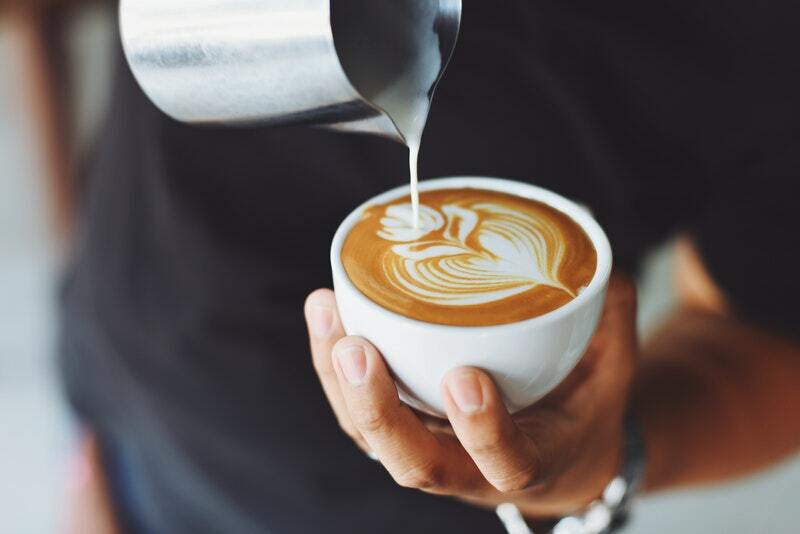 Freshly ground coffee at your corporate event will not only keep everybody awake, it will create a casual environment where guests can order their favourite daily drink. Biscuit & tea bars can be a perfect option for an indoor or outdoor conference venue during winter and autumn. Tasty biscuits, warm scones, honey and a delicious selection of teas will appeal to guests who have a sweet tooth or a need for some comforting snacks. You can’t go wrong with a cheese and chocolate bar. Serve this up after guests have enjoyed a few refreshments and the event is winding down. Guests with a sweet tooth will thank you for this one! Snack bars are a very broad catering option. Here you could serve tacos and nachos, appetisers, popcorn, crisps, hot chips, cheeses and breads, etc. Depending on the type of event some snacks might be more suitable than others. If you’re starting the conference or meeting early, it may be a good idea to throw in a breakfast bar. Breakfast stations could serve pancakes, omelettes, sausages, bagels, and so on. Don’t forget to have a coffee station right next to this one! Asian food is delicious, easy to eat and easy to serve! 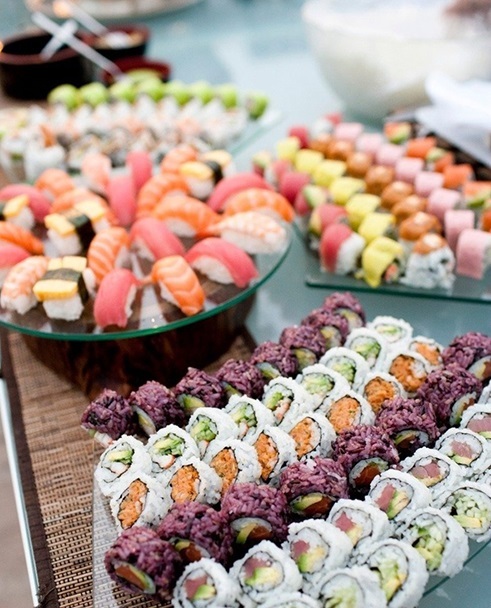 Your guests will go crazy over the sushi and nigiri. These bite-sized snacks are often served with cocktails. This option is a favourite at corporate launch parties or events where guests will be standing and mingling. There is no specific way to present these food stations at your corporate event. As long as you are confident that your guests will love it, you can mix and match to serve something truly unique. For those of us not jetting away to the sunnier continents for some well-deserved fun in the sun, we have put together some great ideas so you can bring the fun to you and not have to venture out in this winter madness. For an all-inclusive package of just $89.00 we will bring you a warming, delicious cocktail party with no fuss, no umbrellas and no cleaning afterwards. Valid – 1st June 2017 through to the 31st of July 2017. Contact us today to get more information on this deal or book your event today! So you've got a corporate or private event coming up. Inviting guests, organising the catering and deciding on a theme are all important aspects of event planning, but many event planners and hosts are stumped when it comes to finding the right venue for their event. Space, decor and locale all combine to make a great venue. At Laissez-faire, we want to take the stress out of your event planning. 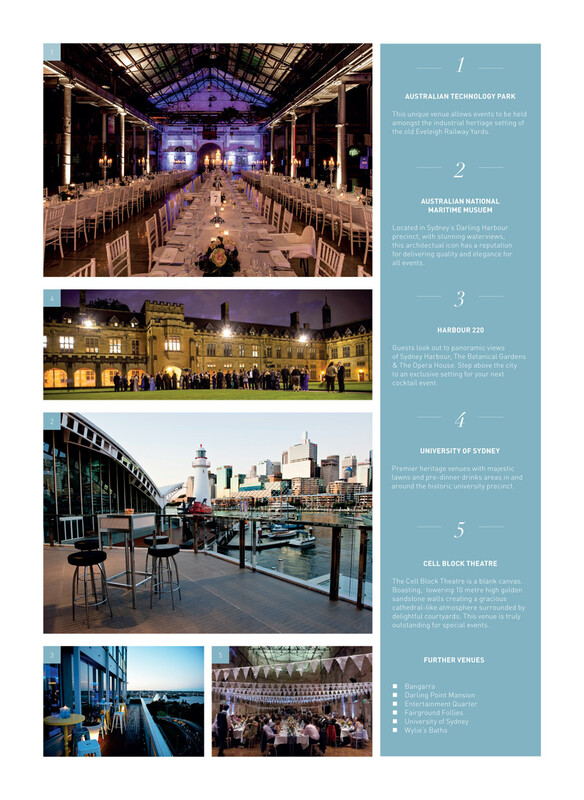 That's why we've put together these top 5 venues for your event brochures depending on the type of event you are having. So if you're planning a cocktail. dinner or corporate event, we've got you covered! Scroll down and click on the brochures to download them. If you'd like more information about any of these venues, feel free to contact us or check out our venue listings. Be inspired. 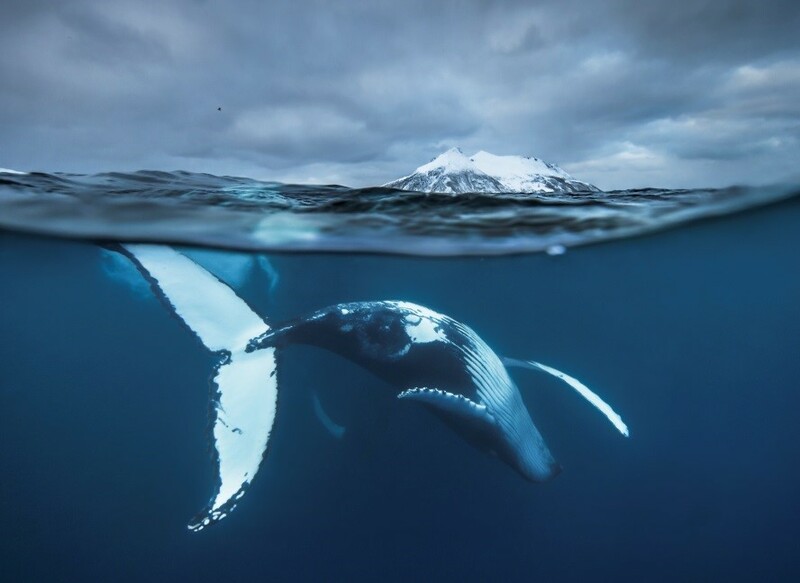 Reconnect with the wonder of nature through the magic of photography. Once a year we have the unique opportunity of working with the gallery and the exhibition to offer this artistic space as an event destination, it offers a truly wonderful and immersive opportunity to be a part of a WORLD-WIDE EXHIBIT!! See below for an exclusive offer. 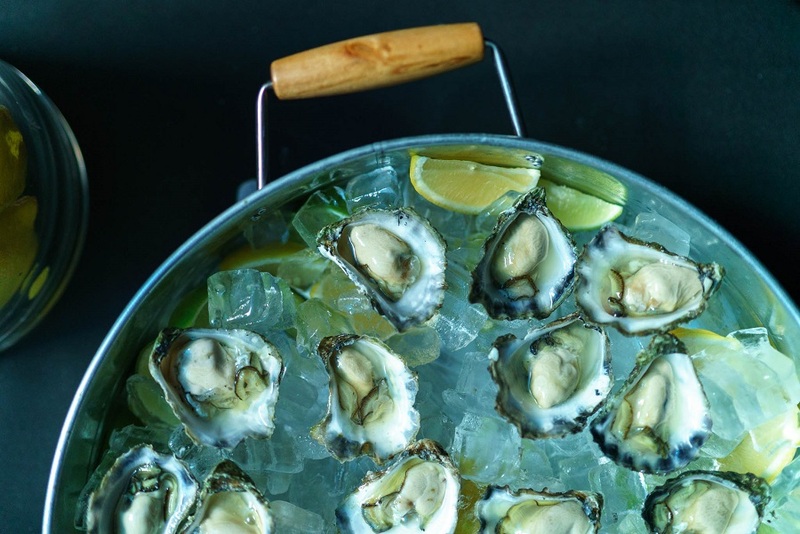 Laissez-faire will deliver perfect food and beverage solutions tailored specifically for your event - from cool cocktails to stylish dinners, you'll be impressed by the variety of menu options, willingness to collaborate and the high standards of service delivery. We’re making it really easy this year, just let us know how many people are coming! 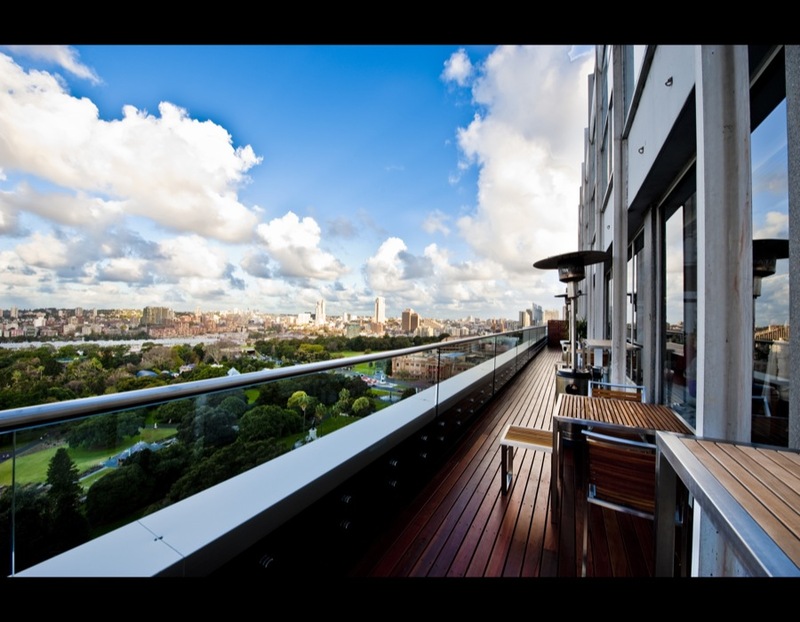 With stunning views of Sydney Harbour and overlooking the Botanical Gardens, Harbour 220 is exclusive and intimate. 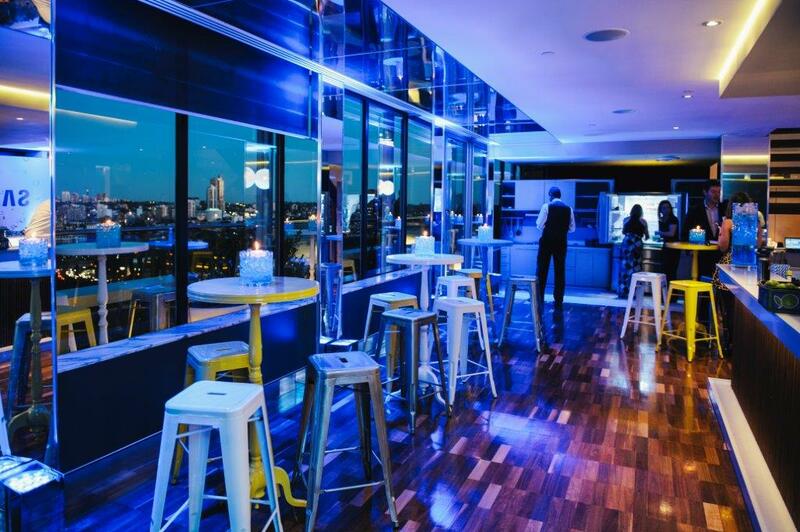 Located on the 15th floor of the Hudson Building on Macquarie Street in the heart of Sydney’s CBD, this venue is ideal for corporate and private functions and is available for evening events, from cool cocktails to stylish dinners. The pillarless ballroom has a capacity of up to 100 guests for a sit-down event, including a pre-drinks bar area designed to welcome and entertain guests with elegance and sophistication. A newly refurbished balcony also features. Laissez-faire will deliver perfect food and beverage solutions tailored specifically for your event - from cool cocktails to stylish dinners, you'll be impressed by the variety of menu options, willingness to collaborate and the high standards of service delivery. Breakfast events seem to be the new trend in the business and corporate world. Whether it’s for a client meeting, a board meeting or just a company catch up, the most important meal of the day is increasingly becoming a popular choice among corporate companies and even private organisations. 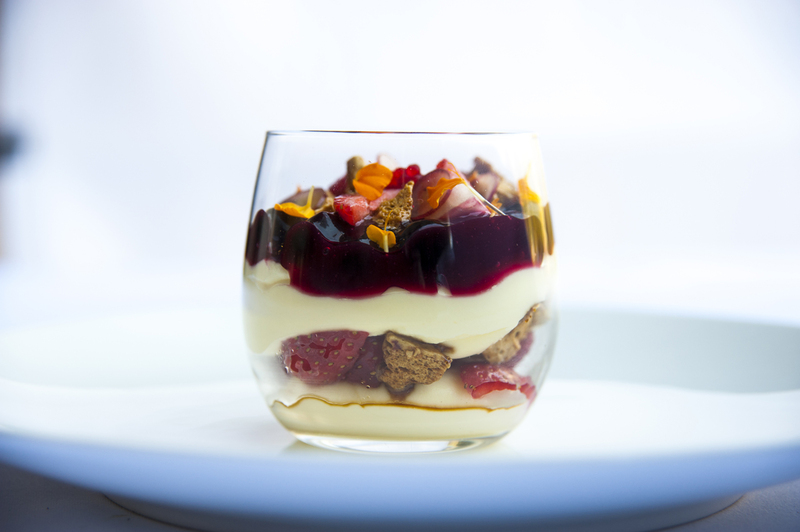 So why choose a breakfast event for your office? There are two important reasons why events held during breakfast are refreshing and psychologically stimulating. One, people are most alert, awake and productive early in the morning; two, holding an event for people during this time will be a good idea since you will not be interrupting their work during the day. As it soars in popularity, many are now preferring breakfast meetings over lunches in the business world. In a survey conducted by OnePoll, it was found that meetings hosted in the mornings have more positive outcomes since people pay more attention to the agenda at this time. Plus, any corporate or even private event hosted during the morning is more cost-effective than lunch. The idea of mornings also expresses informality and a more relaxed style which at some point can set an easy tone and help establish business relationships fast. You may need to hurdle another problem though, not all of your workers are morning people. Carefully planning this to your advantage will make a great start for everybody’s day. The idea of starting the day with good breakfast can fuel people up especially those who will be facing a long day. You can check your caterer’s menu in advance and make reservations. And of course understanding your guests food preferences will help in making the event a success. Will it be simplified? Caffeine fueled? Gluten free? With lots of add-ons? A brunch? Now, try considering these in your options and give your breakfast meetings an instant boost. Or you may opt for other breakfast choices like themed breakfasts or ethnic breakfast dishes. And if you are enjoying this too much and you want breakfast menus any time of the day, brinner (breakfast dinner), can be an option too. Check out our other healthy and flavoursome breakfasts on Instagram. We are absolutely loving this venue right now. 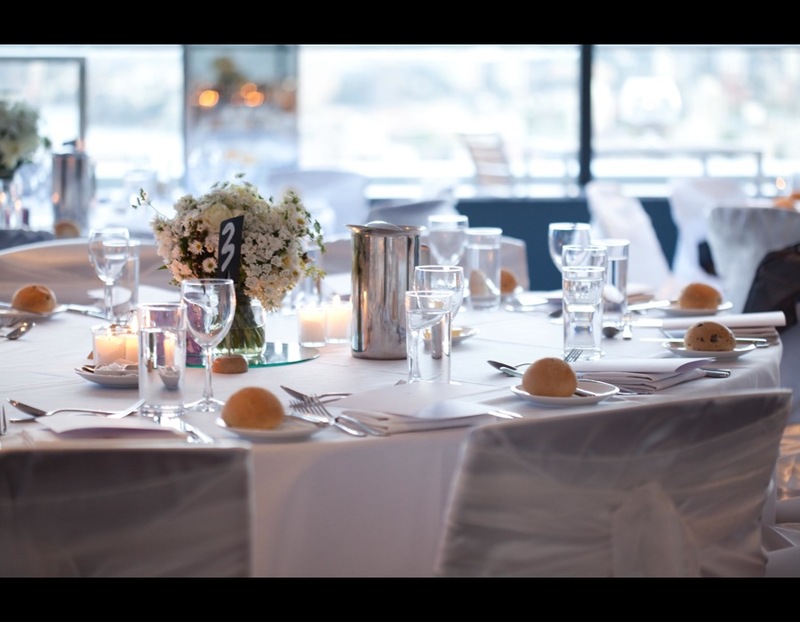 With stunning views of Sydney Harbour and overlooking the Opera House and Botanical Gardens, this venue is exclusive, intimate and high class. Harbour 220 boasts a pillarless ballroom with the capacity to seat 100 guests comfortably, including a pre-drinks bar area designed to welcome your guests and entertain them with elegance and sophistication before and after every event. Located on the 15th floor of the Hudson Building on Macquarie Street in the heart of Sydney CBD, it is ideal for corporate and private functions and is available for all day and all night events, from cool cocktails, fresh lunches to stylish dinners. Laissez-faire will complement your booking with a variety of menu options, willingness to collaborate and high standards of service delivery. We are offering an extraordinary deal for this venue! Take a look at these stunning photos and imagine how your own event could look in this incredible space. Annual corporate dinners are regular features for most companies. It becomes a night for showcasing new products, networking, an opportunity to reward employees, celebrate a milestone, present new people or just a social event that can bring everybody together which is rare for larger companies. Over the years, the idea of organising for events like this have changed. It has evolved into something more exciting and something that an organisation looks forward too. 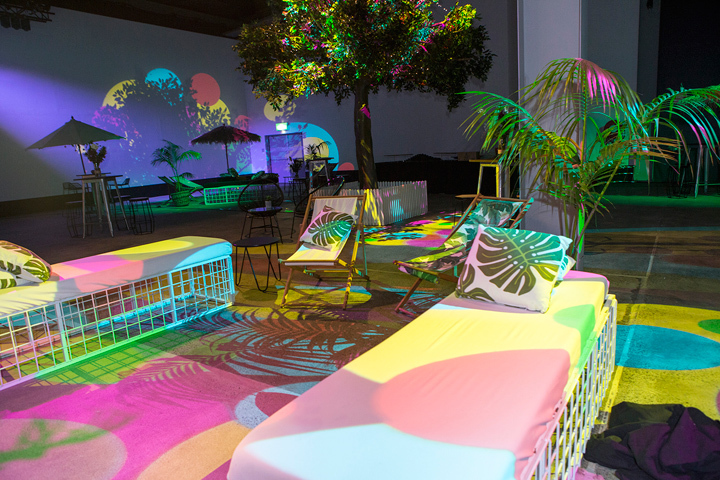 Companies try their best to experiment on entertainment options, catering, themes, and venues. 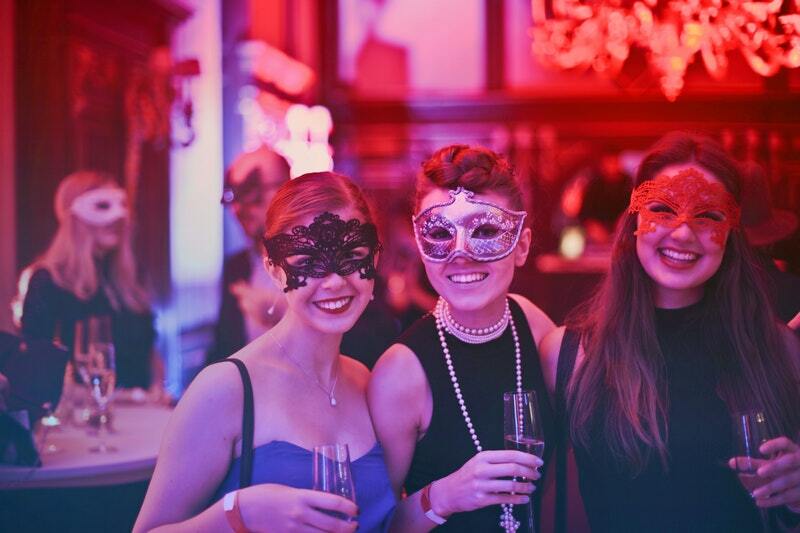 We think themes make corporate events even more special. Why hold themed annual dinners? It builds up excitement for everybody. That is if the theme is chosen well. The talk can spread and generate more audience and will assist in the marketing of that event later on. And you can create themes from anything you fancy. Companies can use a theme to relate back to the reason for the dinner. It ties the whole event together. Whether it’s just the colour palette or the dress or the decoration, the theme can act as a unifier. People will literally snap hundreds of photos at a fun and instagrammable event. So imagine the social media exposure you can get from this. Creating impact around your annual dinner can help it spread on social media. The idea of dressing up for each of the seasons is different and can be done any time of the year. Plus it can offer more ideas for decorating. And the food choices for this theme can be seasonal as well. Choose a venue that can showcase it well and you are good to go. There’s no such thing as too extravagant if your aim is to revolve the party around your brand. Why not, right? 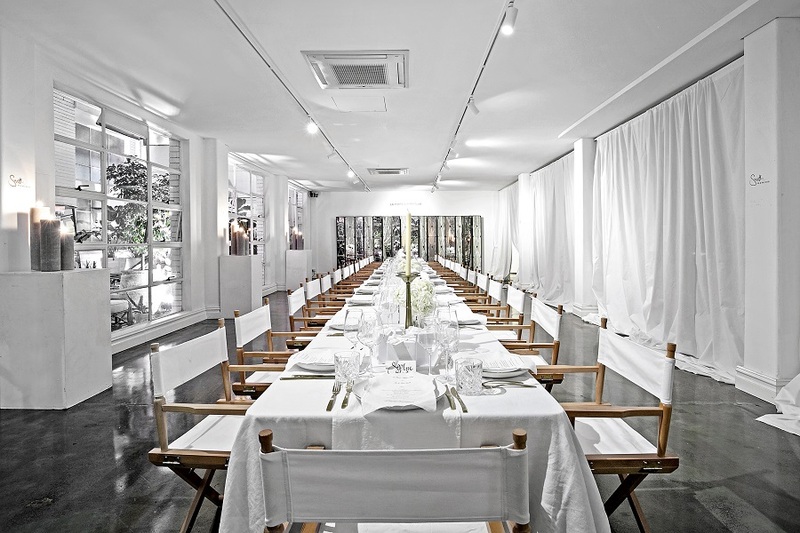 Brand themed dinners creates the psychology of oneness. Incorporating your company logo and design to the decor, the food design and the entertainment can create one fun dinner party. This helps you, as an organisation to stay focused on the objectives and on the idea of your company as a whole as well. Remember, brand identity sells and will make your guests happy they are part of something so great. 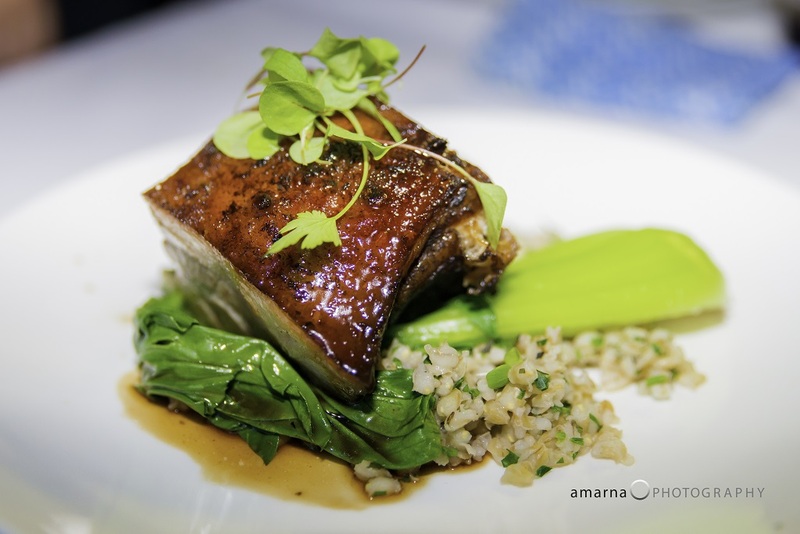 Have you ever been to a sustainable themed dinner? It adds to the value of the event. In the world where many businesses try to promote sustainability in the office and at home, a themed dinner like this can create a big impact not only on the organisation but on your social media followers as well. You can include this in your objective as well as a company. All decor must be central to sustainability. Recyclable utensils, no plastic and the idea of after party leftovers being composted is a good goal. For food, including sustainable produce for catering is a great and delicious idea. Era themed dinners never seem to get old and still excite everybody. Plus, there are so many eras to choose from. You can go futuristic, 1950’s, or maybe 1970’s. You have lots of choices. For this, choose a venue that can be transformed to fit your theme as well. 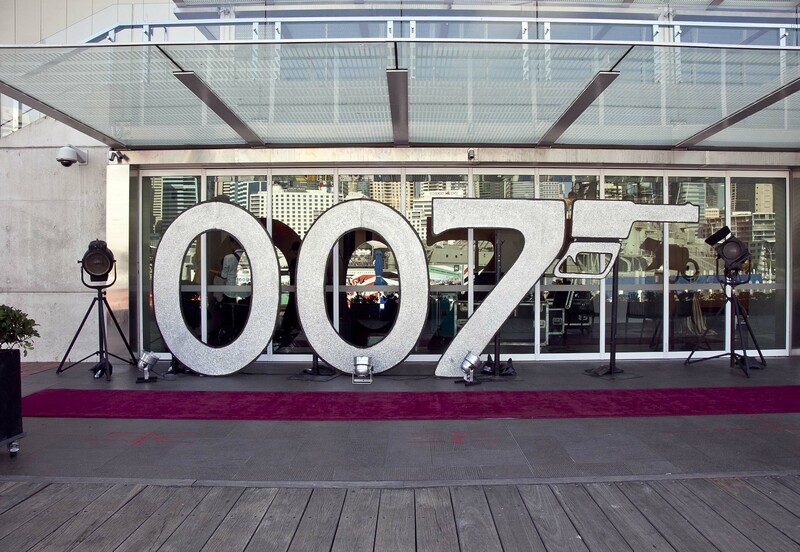 Remember that James Bond themed dinner you saw on our Instagram? You can pull it off too for your event. It’s easy and a nice way to cater the event for everybody. Other choices include Wizard of Oz, Harry Potter, Academy Awards, Casablanca, old Hollywood, etc. It will create excitement and will give everybody something to talk about during the event and even after it happened. So, have you chosen your annual dinner theme?